Quarterback Ehrlich has a 100 percent approval rating from the Broadneck faithful in his first year of a four-year term. “It was certainly a challenge at first, getting used to the speed of the game and everything, the guys around me certainly made me better,” said Bruins quarterback Josh Ehrlich. As a freshman for the Bruins the son of former Governor Robert Ehrlich set a new school record with 35 touchdowns this season. If Josh is following in his father’s footsteps, you can call receiver Ethon Williams his Lieutenant Governor. The senior owns every school receiving record and recently set the state record for career touchdowns catches with 53. He has 22 this year. “I’m going to do my job and I’m going to get open and catch all the balls that come towards me,” said Williams. “Oh man, throw it anywhere he’ll go up and get it. I’ve never seen anyone jump like that,” added Ehrlich. On Friday the undefeated Bruins (10-0) open up their postseason against against South River (6-4) in the 4A East Regional Semifinal. Broadneck beat the Seahawks 48-30 four weeks ago. “They’re a very good team. I thought it was pretty close the first time we played them. It’s all hands on deck. We’re all going to have to play well,” said Ehrlich. 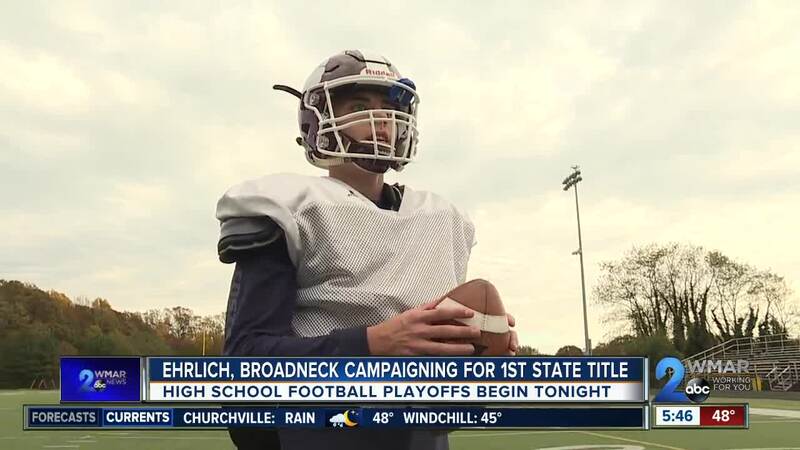 Broadneck’s campaign for a first state title begins Friday at 7:00 p.m. The polls close around 9 o’clock.